My chickens are kicking and the leeks and asparagus is coming into the market. Two sunny side up eggs sit atop a filling of leeks, shallots, wild mushrooms and topped with asparagus and Gruyere cheese. It’s a simple and quick to make savory entrée that celebrates spring! You could also serve it for a brunch. Preheat oven to 400 degrees. Lightly coat the inside of the ramekins with butter. Melt remaining butter in a medium skillet and sauté the shallots (about a minute), add the mushrooms and cook until tender, toss in the leeks and cook until wilted. Add the cream until it lightly bubbles and remove from heat immediately. Lightly blanche the asparagus tips in salted water, rinse and dry. Spread the shallot, mushroom, leeks and cream mixture equally into 4 ramekins. Place two eggs in each on top, add the asparagus tips and cheese. Bake at 400 degrees for 10-15 minutes until bubbling and the eggs are cooked to your desired doneness. This simple braise is perfect with the 2013 Syrah. Lamb and Syrah have a natural affinity for each other and the fall off the bone braising of the lamb shanks and the wonderful marrow of the bones make for a perfectly delicious pairing. Salt and pepper all sides of the lamb shanks. In a large cast iron Dutch oven or deep skillet heat the olive oil until shimmering and sear the lamb shanks on all sides until golden brown. Remove the shanks from the pan and sauté the onion and garlic until translucent. Then add the crushed tomatoes, balsamic vinegar, Syrah, broth and oregano. Stir well until well heated. Return the shanks to the pan and cook in the oven for 3-3 1/2 hours. The meat should literally fall off the bone and the marrow should be easily pulled from out of the bone. 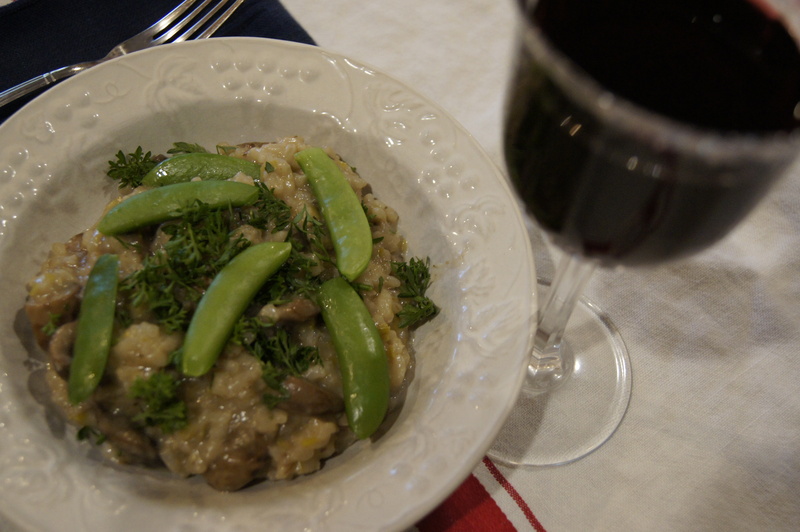 Serve with Blue, White, and Yellow Corn Polenta. 1 cup blue, white and yellow corn grits (polenta). You can find them at the Medford Food Coop. Feel free to use yellow or white corn. Finely sliced or grated Parmesan, aged Monterey jack or other hard cheese or your liking. In a medium sized pan bring 3 cups of water to boil and add the corn. Reduce heat to low and cook until the grits are creamy, 45 minutes to an hour. While the corn is cooking, coat a medium skillet with olive oil and sauté the onion until translucent. Add the carrot and celery and cook until the carrot and celery are softened. Add the kale and cook until wilted. Remove all this from the heat and add to the corn. Stir all together until everything is evenly distributed. In medium sized ramekins or ceramic bowls or ceramic boats. Coat each bowl with butter to prevent the polenta from sticking. Evenly distribute the polenta into the bowls and bake at 350 degrees until bubbling. To finish, add the cheese on top of the polenta and the olives and broil briefly until the cheese is bubbling and starting to brown. Remove and serve with Lamb Shank Osso Buco paired with Ledger David Cellars 2013 Syrah. So you are wondering, why is Robert pairing chicken with Cabernet Franc? Well, sometimes rules are meant to be bent, especially when it comes to food and wine. This pairing may well be one of the most integrated and balanced I have put out there for you all. It is balanced, like Ledger David Cabernet Franc. It is straight forward (super easy) and perfect for these hectic holiday times and it is healthy. What more could you ask for? I roasted olive oil and salted purple potatoes with the chicken to add to the meal. The subtle flavors of herbs de Provence matches perfectly with our Cabernet Franc. The leg meat being the dark meat of the chicken is rich and complimentary to the wine. Oh, and don’t hesitate to try this on turkey, pheasant, quail, or chukkar. Mix the herbs de Provence, lemon juice, olive oil and salt and pepper in to a bowl and whisk together. Pour this marinade over the chicken and thoroughly coat. Place the chicken into a large cast iron skillet. Cut the shallot in ½ length wise the finely slice. Garnish the chicken with the shallot in the skillet. They will crisp up nicely and add another layer of depth. Preheat oven to 475 degrees. Roast chicken and potatoes 40-45 minutes until golden and cooked through. Season to taste with salt and pepper. Add a fresh field greens salad and serve with Ledger David Cellars 2013 Cabernet Franc…You are going to love it. Fast, simple and so delicious! Enjoy tastes of this seasonal wine with special treats this Halloween, October 31 from noon-5pm at Le Petit Tasting Room! Combine ingredients and simmer on low in small crockpot for two hours. Strain carefully. Ladle into mug, and garnish with candy cane. NOTE: You can grind all of these on your own in a granite mortar and pestle, except the nutmeg which will need to be grated first. All of this will result in better and more nuanced flavors but can buy them pre-ground. I recommend grinding your own. If you don’t own a mortar and pestle, you can use a food processor or blender but the flavors will not be as complex. Additionally, you could buy a pre-made green curry but it will be nothing like this in terms of richness and freshness of flavor and the ingredients could be quite different. 1 medium sized lime- Zest the whole skin down to the flesh just before you hit the juice of the lime. 16oz. can organic unsweetened coconut milk (you’ll only be using the creamiest part so DON’T shake it up, you’ll just spoon off the heavy cream into a small sauce pan). Save the watery potion to add back into the sauce if it needs thinning. In 2000 I started learning to cook Thai food as a way to decompress from my hectic work life. Thai food has a rich and powerful range of flavors and an ancient history. Much of it is fast paced and requires complete focus and its very healthy. Making curries is particularly satisfying, especially in eliminating stress. I make mine in a traditional Thai granite mortar and pestle of medium size. The pounding and mashing of the ingredients to achieve a rich paste is physically engaging, the smells are wonderful and the end result are deep rich flavors that can’t be beat. I work in batches and make about a pint of paste at a time and use as much as I need in my coconut sauce based on taste. There are nearly infinite opportunities for experimentation. This is just one interpretation that works out beautifully in pairing with Ledger David Cellars 2014 Sauvignon Blanc. One word of caution, if you’re in a hurry, this part may just cause frustration. Slow down and focus on the task at hand and you’ll be well rewarded. The rest is easy. Start with the dry ingredients. Grind the white and black peppercorns until fine and then add the coriander seed, cardamom, nutmeg, sea salt and cumin and set aside. After all the wet ingredients are finely chopped or nearly minced, start adding the garlic, ginger and shallots then the jalapeños lime zest and basil. Slowly and persistently keep grinding these wet items into a paste. A little extra coarse salt will help breakdown these ingredients. Continue until you have a nice green paste. Add the dry ingredients back into the wet and grind until thoroughly entrained and you have a nice paste. Your paste is ready to add to the coconut milk to finish your sauce. To finish the sauce, heat the coconut milk cream until it just starts to break/boil. Reduce the heat and add about three tablespoons the paste and cook slowly for 10 minutes of so. Additionally I add about a tablespoon of sugar to the sauce and a handful of finely chopped basil right at the end before plating. Keep warm and set aside to place on the fish when they are cooked. Add salt and pepper to taste to about a ½ cup of flour. Pat the cod fillets lightly dry and dust them thoroughly with the flour. In a large cast iron skillet or cast iron wok set to medium high heat enough peanut or canola oil to nicely coat the bottom. Heat until the oil glistens and add the fish cook on first side until golden and crispy. Carefully flip once until the second side is done and remove to a wire racked tray and keep in the oven if needed at 300 degrees. Note: This gives you a little extra time to plate the rice and so on. Plate about a cup (or portion to your guests liking) of cooked jasmine rice, place the finished cod on the rice and sauce the fish with the green curry. Serve immediately. I like to add a slice of fresh cantaloupe or other melon, but fresh salads and so forth are also nice sides when it is hot out outside. This green curry with cod was a huge hit with my guests. The pairing with the Ledger David 2014 Sauvignon Blanc is superb. Enjoy. Teaspoon each of the following finely chopped: (Your choice of variety of what you have in your garden of these herbs or purchase your choice at the market. Brown 1/8 of a pound of unsalted butter. Watch carefully. Start at a low medium heat and don’t turn your back. When the butter starts to break brown (it will pop little brown bubble pockets), remove from heat immediately. Add your herbs and return to the lowest heat and hold for 10-15 minutes. Remove the pan from heat and with a big mixing bowl full of ice water, cool your infused butter until medium soft. Set aside. Place the chicken into a large ceramic or cast iron roasting pan. You can do the rest of the work from here with no need to dirty up another surface. From the neck end of the chicken, with your hands, carefully lift the skin away from the breast meat side of the bird creating a cavity within which you’ll evenly place the soft infused butter. It is really simple and really easy, go slow and distribute the infused butter evenly. Once you have placed the butter under the skin, place the quartered lemon sections inside the chest cavity of the bird and truss the legs. To truss, simply take a foot long length of cotton twine and tie the ends of the legs together tightly. No need to get fancy. Just tie them up to hold them together. Rub a bit of the infused herb butter onto the legs and wing parts and dust with salt and pepper. Preheat your oven to 450 degrees. Turn the oven down to 350 degrees and roast for about 10-15 minutes a pound. Cook until done. 170 degrees. Let the bird rest for 10-20 minutes, carve and serve. Serve with a side of fresh field greens salad, Rogue Creamery Smokey Blue cheese crumbles dressing and the best summer time melon you can find. Enjoy with Ledger David Cellars 2014 Primoris. You’ll be pleased. Slice the mushrooms into thirds. Melt 2 tablespoons butter in heavy large skillet over medium-high heat. Add 1/4 of mushrooms and sprinkle with salt. Sauté mushrooms until tender and beginning to brown, 3 to 4 minutes. Transfer mushrooms to medium bowl. Working in 3 more batches, repeat with remaining 8 (divided equally) tablespoons butter, remaining mushrooms, and salt and pepper. Bring the chicken broth to simmer in a saucepan and keep warm. Melt remaining 1 1/2 tablespoons butter with olive oil in heavy large saucepan over medium-low heat. Add leeks, sprinkle with salt, and sauté until tender, 4 to 5 minutes. Add rice and increase heat to medium. Stir until edges of rice begin to look translucent, 3 to 4 minutes. Add the wine and stir until liquid is absorbed. Add 3/4 cup warm chicken broth; stir until almost all broth is absorbed, about 1 minute. Continue adding broth by 3/4 cupfuls, stirring continuously until almost all broth is absorbed before adding more, until rice is halfway cooked, about 10 minutes. Stir in sautéed mushrooms. Continue adding broth by 3/4 cupfuls, stirring until almost all broth is absorbed before adding more, until rice is tender but still firm to bite and risotto is creamy, about 10 minutes. Stir in 1/4 cup grated Parmesan cheese, if using. Serve with additional Parmesan and chopped Italian parsley. This is wonderful main dish or can be served as a side with grilled meats.